Slips, trips and falls send 9 million people to the hospital each year. Slips, trips and falls are the leading cause of workers’ compensation claims, costing an average of $20,000 per incident/accident and result in nearly 95 million workdays lost per year. Fifty-five percent of the time, “wet” walking surfaces are the cause for slips and falls. 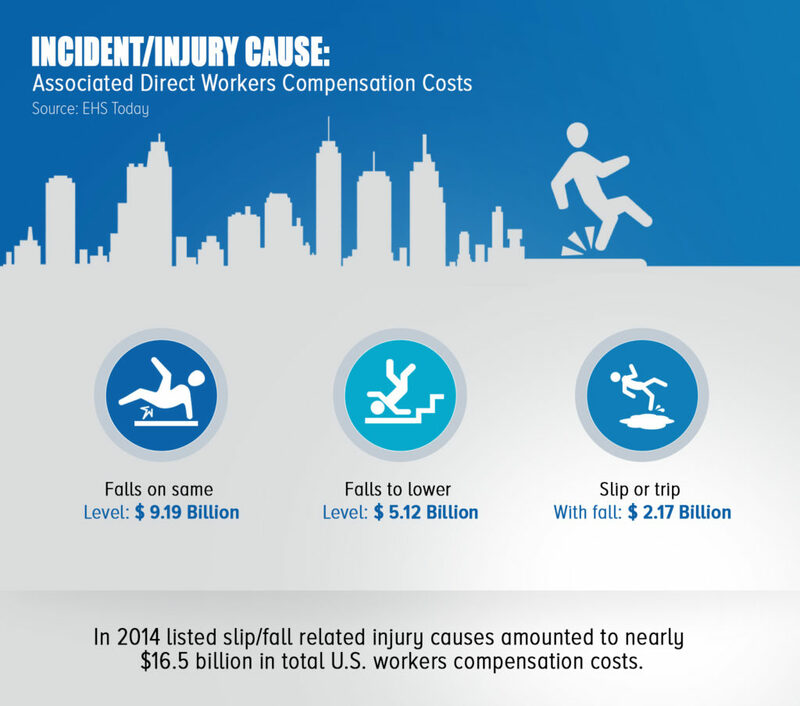 In 2014 listed slip/fall related injury causes amounted to nearly $16.5 billion in total U.S. workers compensation costs. Slip-resistant standards and codes have been a moving target over the years. In 1991, the Americans with Disability Act (ADA) recommended a 0.6 SCOF on level surfaces and 0.8 for ramps. But no specific test method was specified. In 2004, the ADA removed those recommendations. ADA now says simply “The surface must be firm, stable, and slip-resistant throughout its lifetime.” In fact, the ADA recommendation was virtually meaningless because there are so many different devices available to measure the SCOF for the same surface with different sensors, geometry, and speed of travel. Groups such as the Ceramic Tile Institute and the City of Los Angeles have in the past said the COF of 0.6 should be the standard based on ASTM C-1028. The ASTM C-1028 is a standard test method for determining the static coefficient of friction of ceramic tile and other like surfaces by the horizontal dynamometer pull-meter. Several deficiencies in ASTM C-1028 have been identified including that the device is manually operated and subject to inconsistencies due to the operator. ASTM C-1028 only measures the static coefficient of friction, not the dynamic coefficient of friction. ASTM C-1028 has no consensus on the amount of resistance that is required to produce slip resistance and test results can be misleading on polished stone and tile which can demonstrate an adequate static coefficient of friction when dry, but can be very slippery under wet conditions. Given the shortcomings of the ASTM C-1028 standard, various industry organizations have spent a considerable amount of time and resources to develop a more practical and reliable test method to better indicate what is slip-resistant. As a result, the industry groups have developed new standards to include the Wet Dynamic Coefficient of Friction (DCOF) as the preferred measure of slip resistance. The BOT–3000E digital tribometer has been identified as the preferred measuring device, as it is not subject to human error, it measures both SCOF and DCOF and the results are repeatable on flooring surfaces. A Wet Dynamic Coefficient of Friction of .42 has widely been accepted as the minimum dynamic coefficient of friction to prevent/limit slips on wet surfaces. The underlying methodologies and the .42 quantitative threshold was derived from years of intensive research in Germany, Great Britain, and other European countries. The European research concluded that even the most vulnerable people could reduce their risk of slipping while walking to 1 in 1,000,000 (or better) when the “available friction” on a level floor-shoe interface met or exceeded DCOF of 0.42. The concept of “available friction” is that, regardless of prevailing conditions (wet, dry, clean, contaminated), the walkway surface should still deliver a certain DCOF to prevent a slip from becoming a slide or possibly a fall. The supporting research was tested over three years by German researchers at university and government labs and the results confirmed the threshold of 0.42 DCOF as the best available standard for Dynamic Coefficient of Friction. Starting in 2009, more rigorous standards, testing equipment, and procedures were introduced to assist building owners, manufacturers, architects, and specifiers in identifying the slip resistance of a variety of surfaces. In 2009, The National Floor Safety Institute (NFSI) and the American National Standards Institute (ANSI) published ANSI/NFSI B101.1 Test Method for Measuring Wet SCOF of Common Hard-Surface Floor Materials. In 2012, The National Floor Safety Institute (NFSI) and the American National Standards Institute (ANSI) published ANSI/NFSI B101.3 Test Method for Measuring Wet DCOF of Common Hard-Surface Floor Materials Including Action and Limit Thresholds for the Suitable Assessment of the Measured Values. In 2012, the Tile Council of North America (TCNA) adopted ANSI Standard A137.1-2012 and introduced it as the industry standard. These and other organizations have begun to set standards and guides based on wet SCOF and DCOF values using the BOT–3000E device. The International Building Code set a minimum wet DCOF of .42 based on ANSI A137.1. The TCNA, as noted in the TCNA Handbook, adopted a minimum DCOF of .42 for level interior walkways for wet conditions. The NFSI offers 3rd party independent certification tests of flooring related products based on ANSI/NFSI B101.1 and ANSI/NFSI B101.3. The NFSI developed ANSI/NFSI B101.0 – 2012: Walkway Surface Auditing Procedure for the Measurement of Walkway Slip Resistance. The Concrete Polishing Association of America (CPAA) adopted ANSI A137.1 and a minimum DCOF of .42 for floors subject to wet conditions. With the development of these industry standards and the acceptance of the BOT–3000E device, the flooring, and related industries now has rigorous procedures and measurement tools that are independent, repeatable, defensible and supported by years of research and testing. Building owners, building operators, the professional design community and their clients have objective studies and information regarding slip resistance of hard flooring surfaces. In addition, the American Institute of Architects (AIA) now includes the ANSI A137.1 standard in Section 093013, Ceramic Tiling, in their AIA MasterSpec. It is not possible to prevent all slips and falls, as they can be caused by irregular walking surfaces, contaminants, footwear and human error. What is most important is to minimize slip and fall risks through due diligence and the use of best available practices and technology.